Ideal for all ages and abilities, in search of outdoor adventure with courses from 1k to 5k, for runners, walkers and also for families with children! Loads of help is aviailble from our friendly Welcome Team and no experience is necessary. New to orienteering? It's a trail walk/run (and often an off-trail run!) with a difference - an orienteering race doesn't follow a set route. Instead you have to visit a series of checkpoints and register each one with an electronic timing chip. The checkpoints are marked by flags on the ground and may be along paths, fences, earth banks, streams or anywhere in the woods or around the woods. The challenge is to race between each one, choosing your own route between the checkpoints, using a special orienteering map (which you get to keep too). Why not come and give it a go? 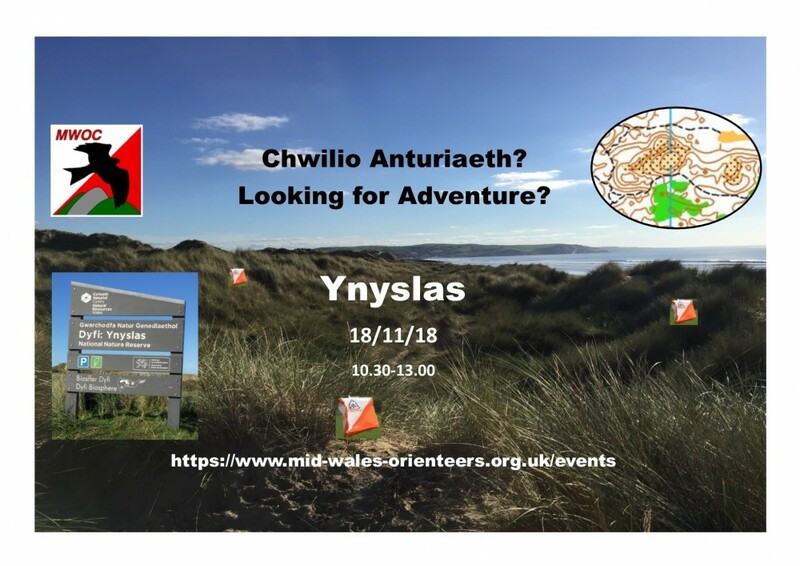 Parking on the beach at Ynyslas, registration and start on the south side of the visitor centre. Are you up to the navigation challenge? A great path network and fantastic contour detail showing the shapes of the dunes with open sand areas marked. Fantastic views from the highest dunes along the coast and over the Dyfi estuary if you take the time to look. Great cafes and pubs in Borth or the lovely Clettwr for refuelling after you course for a great day out. Family groups welcome to share a map and pay per map/dibber. You can enter a child or children and the adults can accompany them for free! Dogs under control are welcome. Please take particular care inside the fenced enclosure where there are sheep grazing and be aware it is a popular area with dog walkers. Green, Blue and Brown Courses are more physically and technically demanding course using interpretation of contours, recognition of indistinct features, concentration over long distance. Dogs under control are welcome. Please be aware there are a few sheep in the central fenced area which all courses will go through. The fenced area is marked on the map and access is through gates or stiles. Public Toilets in Borth opposite the turning to the railway station.